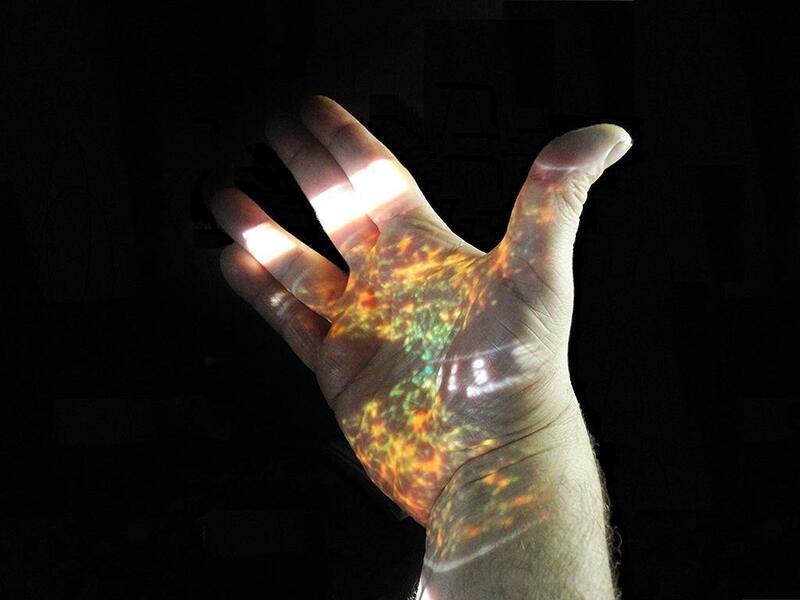 Live Long And Prosper by Tom Estes Digital map of all the known galaxies in the universe projected onto the artist’s right hand. Each dot represents a whole Galaxy just like our own Milky Way. The hand is in a salute which first appeared in popular culture through the television series Star Trek. But this salute has nuch older origins. It turns out it is an ancient priestly blessing that forms the Hebrew letter Shin. The connection between art and the social is undeniable. The historic city of Venice, for example is a living “open-air” museum with a cultural and artistic heritage of inestimable value. The city also plays host to The Venice Biennale — has for over a century been one of the most prestigious cultural institutions in the world. 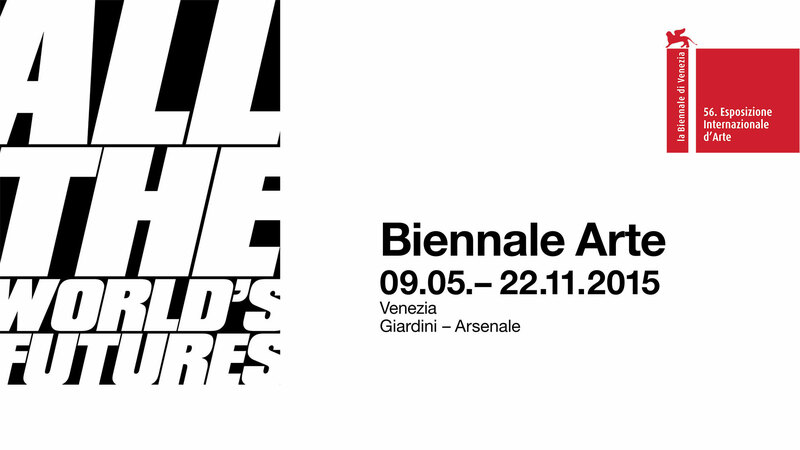 “All the World’s Futures” is the title of the 56th Art Exhibition organized by la Biennale di Venezia and curated by internationally recognized Nigerian born, Okwui Enwezor. This year the organizers of The Venice Biennale employed a metaphorical “Filter”, for the historical trajectory that the event itself, over the course of its one hundred and twenty years of existence has run over. A Filter through which to reflect on both the current “state of things” and the “appearance of things. The President of la Biennale di Venezia, Paolo Baratta, accompanied by the curator, Okwui Enwezor, met with the representatives of the 53 Countries participating and determined this years theme for 2015. A “Parliament of Forms” rather than one overarching theme was chosen. The title and theme which is ‘All the World’s Futures’ is informed by a layer of intersecting “Filters” or a constellation of parameters that circumscribe multiple ideas, touched upon to both imagine and realize a diversity of practices. The Biennial Project Residency Project takes place in the heart of the historic city of Venice — an “open-air” museum with a cultural and artistic heritage of inestimable value. The residency for this years recipient, Tom Estes also takes place during The Venice Biennale — which has for over a century been one of the most prestigious cultural institutions in the world. This year’s Biennial Project Artist in Residence, Tom Estes has always leaned toward making Live Art performance work that is participatory or immersive in some way. 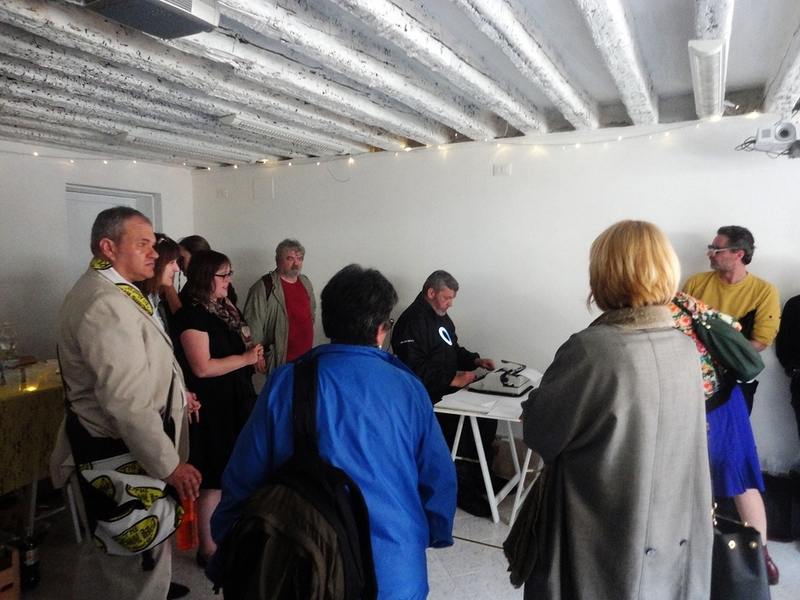 In his Live Art performance Estes stages an ‘action’ and then ask members of the audience to take pictures on a communal camera. In this way, the audience becomes part of the performance, and the pictures are then posted on on-line social networking sites and web sites for another, wider on-line audience. In the search for a language and method for an exhibition in Venice, Artist Tom Estes settled on the nature of the exhibition as fundamentally a visual, somatic, aural, and narrative event. In so doing, he asked how an exhibition of the scale and scope of the 56th International Art Biennale could be addressed in its format and refreshed within the potential of its temporal capacity. In recent years science and technology have begun to catch up with science fiction. So many of the fantasies and illusions of the past are no longer a contradiction of reality, but instead an integral part of our everyday lives. Through his practice artist Tom Estes directly references the surreal wit of Sci-fi and horror and their related ideological fictions. But the above image is a real map comprised of high-quality raw scientific data collected to maximize the understanding of three scientific themes: Dark energy and cosmological parameters, The structure, dynamics and chemical evolution of the Milky Way & The architecture of planetary systems. And case you were wondering… all in all, there is an estimated 100 billion galaxies in the universe. To count them all, you have to be able to look far enough back in time or deep enough in space to see when galaxies were formed. Through the work, Estes glimpses the possibilities and problems that emerge when becoming a digital entity. The concept of liveness and epic duration in the work served two complementary purposes: they suggest the idea that All the World’s Futures is both a spatial and temporal manifestation that is relentlessly incomplete, structured by a logic of unfolding, and a program of events that can be experienced at the intersection of liveness and display. Estes explores the phyical in relation to the non-physical and the coexistence of disparate elements within shared spaces. This can be seen in relation to Einstein’s theory of general relativity which predicted that the space-time around Earth would be not only warped but also twisted by the planet’s rotation. 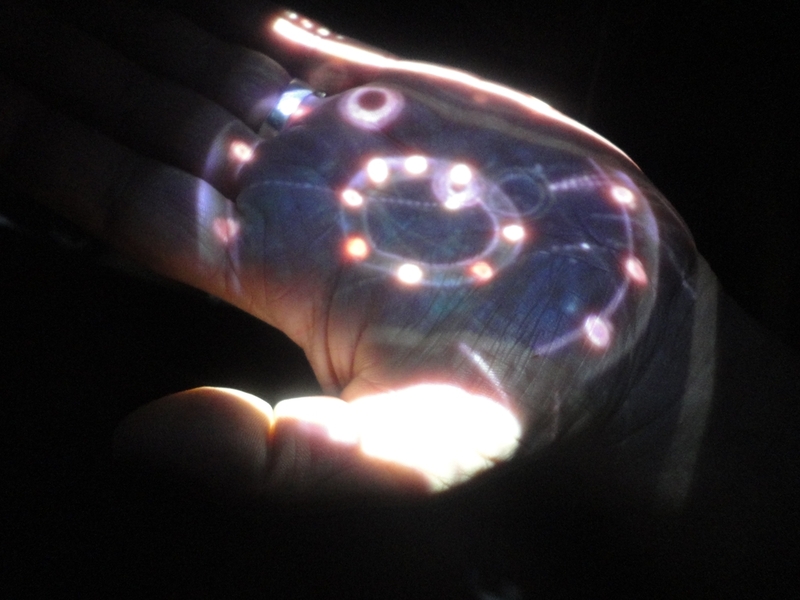 By enacting a Digital Universe Atlas of all the known galaxies in the universe projected onto the artist’s hand, Estes draws on the many works of science fiction as well as some forecasts by serious technologists and futurologists predict that enormous amounts of computing power will be available in the future. Each digital dot represents a whole Galaxy just like our own Milky Way. The digital display staged by the artist is a dramatization of the space of as a continuous, unfolding, and unceasing live event. The work activates the micro and the macro as well as other works by the artist that are already existing while referencing and overlapping numerous mainstream, religious, technological and scientific cultural links. Concepts surrounding animation, digital technologies and Science Fiction are expanded and retracted into a digital display that enacts a sort of hysteria around flatness and depth perception in relation to technologies, space and time travel, real and illusory spaces—physical, virtual, the internal, and the external. Back in 2003, British philosopher Nick Bostrom published a paper that proposed the universe we live in might in fact really be a numerical computer simulation. Simulated Reality is the hypothesis that reality could be simulated—for example by computer simulation—to a degree indistinguishable from “true” reality, and may in fact be such a simulation. It could contain conscious minds which may or may not be fully aware that they are living inside a simulation. This is quite different from the current, technologically achievable concept of virtual reality. Virtual reality is easily distinguished from the experience of actuality; participants are never in doubt about the nature of what they experience. Simulated reality, by contrast, would be hard or impossible to separate from “true” reality. So for example the above ‘numerical simulation’ is a recognizable scientific visualization of the theory rather than an actual numerical simulation. Dimension-hopping has never been so easy or so exhilarating. But before you dismiss this idea as completely loony, the reality of such a Sim Universe might solve a lot of eerie mysteries about the cosmos. Gematria is an Assyro-Babylonian system of numerology later adopted by Jews that assigns numerical value to a word or phrase in the belief that words or phrases with identical numerical values bear some relation to each other or bear some relation to the number itself as it may apply to a person’s age, the calendar year, or the like. The best-known example of Gematria is the Hebrew word Chai (“alive”), which is composed of two letters that (using the assignments in the Mispar gadoltable shown below) add up to 18. Though gematria is most often used to calculate the values of individual words, psukim (Biblical verses), Talmudical aphorisms, sentences from the standard Jewish prayers, personal, angelic and Godly names, and other religiously significant material, Kabbalists use them often for arbitrary phrases and, occasionally, for various languages. Some identify two forms of gematria: the “revealed” form, which is prevalent in many hermeneutic methods found throughout Rabbinic literature, and the “mystical” form, a largely Kabbalistic practice. The Vulcan salute (as well as the title) found in Estes’ work Live Long And Prosper first appeared in “Star Trek” in 1967 with the episode “Amok Time.” But where did it come from? It turns out it came from the actor Nimoy himself. Nimoy says in his autobiography that it is a priestly blessing that forms the Hebrew letter Shin. Shin stands for the word Shaddai, a name for God. Because of this, a kohen (priest) forms the letter Shin with his hands as he recites the Priestly Blessing. Shin also stands for the word Shaddai, a name for God. Because of this, a kohen (priest) forms the letter Shin with his hands as he recites thePriestly Blessing. In the mid 1960s, actor Leonard Nimoy used a single-handed version of this gesture to create the Vulcan hand salute for his character, Mr. Spock, on Star Trek. In this Live Art Performance Gags betray complex meanings and socio-political satire, and unrelated objects, locales, and avatars interact in both the same dimension and time as well as imagined ones. 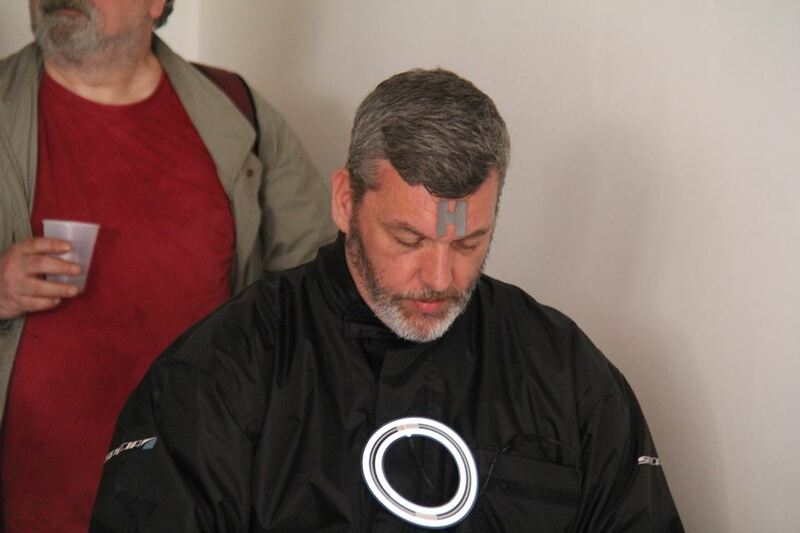 In this performance Estes wears an “H” on his forehead acting out the role of a hologram- thereby suggesting that he is ‘not physically present’ or ‘not really there’. In the Sefer Yetzirah the letter Shin is King over Fire, Formed Heaven in the Universe, Hot in the Year, and the Head in the Soul. The letter shin appears engraved on both sides of the head- tefilin. On the right side, the shin possesses three heads, while on the left side it possesses four heads. In Kabbalah we are taught that the three-headed shin is the shin of this world while the four- headed shin is the shin of the World to Come. The secret of the shin is “the flame [Divine Revelation] bound to the coal [Divine Essence].” A simmering coal actually possesses an invisible flame within it, which emerges and ascends from the surface of the coal when the coal is blown upon. The three levels: coal, inner flame, and outer flame, correspond to the secret of chash-mal-mal, as will be explained in the next letter, the tav. The shape of the letter Shin mimics the structure of the human heart: the lower, larger left ventricle (which supplies the full body) and the smaller right ventricle (which supplies the lungs) are positioned like the lines of the letter Shin. A religious significance has been applied to the fact that there are three valleys which comprise the city of Jerusalem’s geography: the Valley of Ben Hinnom, Tyropoeon Valley, and Kidron Valley, and that these valleys converge to also form the shape of the letter shin, and that the Temple in Jerusalem is located where the dagesh (horizontal line) is. This is seen as a fulfillment of passages such as Deuteronomy 16:2 that instructs Jews to celebrate the Pasach at “the place the LORD will choose as a dwelling for his Name” (NIV). One of the meanings of the word shin in Hebrew is shinui, “change.” The coal symbolizes changeless essence, the secret of the verse: “I am God, I have not changed,” meaning that relative to God’s Essence absolutely no change has occurred from before Creation to after Creation. The inner flame is the paradoxical latent presence of the power of change within the changeless. The outer flame of the shin is continuously in a state of motion and change. As in the above-quoted verse, the changeless Essence is the secret of the Name Havayah. The power of change, as latently present within God’s Essence before Creation and thereafter revealed in the infinite intricacy and beauty of an ever-dancing flame, is the secret of the explicit Name of Creation, Elokim, the only Name of God which appears in the plural. The number of the letter shin, 300, unites these two Divine Names as the “flame bound to the coal.” In at’bash, the Name Havayah transforms to the letters mem-tzadik-pei-tzadik, which total 300. The five letters of Elokim (alef-lamed-hei-yud-mem) when written in full, also equal 300. Transversable Wormhole Coordinates- A Digital Projection by Tom Estes. Recently an international team of scientists studying ultrafast physics have solved a mystery of quantum mechanics, and found that quantum tunneling is an instantaneous process. The three heads of the shin of this world correspond to the three levels of the changeless, potential, and actual change as discussed above. In this world, the changeless is symbolized only by a black, dark coal, not as the revealed light of the flame. Nonetheless the endurance of the flame depends upon the changeless essence of the coal. In the World to Come, the changeless essence will reveal itself within the flame. This revelation of the future is the secret of the fourth head of the shin. In the flame of a candle one sees three levels of light: the “dark light” around the wick of the candle, the white flame encompassing it, and an amorphous aura around the white flame itself. Each of these three levels of revealed light manifests a dimension contained within the invisible flame present in the coal. In general the flame symbolizes love, as is said: “as mighty as death is love…the flame of God.” The dark light corresponds to the love of Israel, souls enclothed within physical bodies. The white light corresponds to the love of Torah. The aura corresponds to the love of God. These are the three essential manifestations of love as taught by the Ba’al Shem Tov. The fourth head of the shin of the future – the revelation of the essence of the coal itself – corresponds to the love of the Land of Israel and, as our Sages teach: “the Land of Israel will in the future spread to incorporate all the lands of the earth. But here is the catch. As off-the-wall as all this sounds, a team of physicists at the University of Washington (UW) has since announced that there is a potential test to the Simulation Hypothesis. Ironically, it would be the first such observation for scientifically hypothesized evidence of intelligent design behind the cosmos. If we are living in such a computer program, there could be tell-tale evidence for the underlying lattice used in modeling the space-time continuum, say the researchers. This signature could show up as a limitation in the energy of cosmic rays. They would travel diagonally across the model universe and not interact equally in all directions, as they otherwise would be expected to do according to present cosmology. Estes created his performance and digital projects for Venice thinking through the lens of 20th-century cartoons, Atari video games, The Sims, ancient Hebrew Texts, the writing of Oxford Professor of Philosophy Nick Bostrom, the innovative and self-reflective film Tron and televison series Star Trek and Red Dwarf, and other children’s entertainment. Let us suppose for a moment that these predictions are correct. One thing that later generations might do with their super-powerful computers is run detailed simulations of their forebears or of people like their forebears. Because their computers would be so powerful, they could run a great many such simulations. Suppose that these simulated people are conscious (as they would be if the simulations were sufficiently fine-grained and if a certain quite widely accepted position in the philosophy of mind is correct). Then it could be the case that the vast majority of minds like ours do not belong to the original race but rather to people simulated by the advanced descendants of an original race. It is then possible to argue that, if this were the case, we would be rational to think that we are likely among the simulated minds rather than among the original biological ones. The extraordinary vision of the Simulation Hypothesis and it’s bizarre Twilight Zone twist, was first published by Hans Moravec in 1988, pushed the boundaries of imagination, science and digital-effects technology. In 2003, Oxford University philosopher Nick Bostrom published a paper that proposed the universe we live in might in fact really be a numerical computer simulation. The mind-twisting Simulated Reality hypothesis suggests that reality could be simulated—for example by computer simulation—to a degree indistinguishable from “true” reality, and may in fact be such a simulation. It could contain conscious minds which may or may not be fully aware that they are living inside a simulation. This is quite different from the current, technologically achievable concept of virtual reality. Virtual reality is easily distinguished from the experience of actuality; participants are never in doubt about the nature of what they experience. Simulated reality, by contrast, would be hard or impossible to separate from “true” reality. The paper exemplifies the idea that a sufficiently cool outcome justifies all of the tortured narrative it takes to get there.